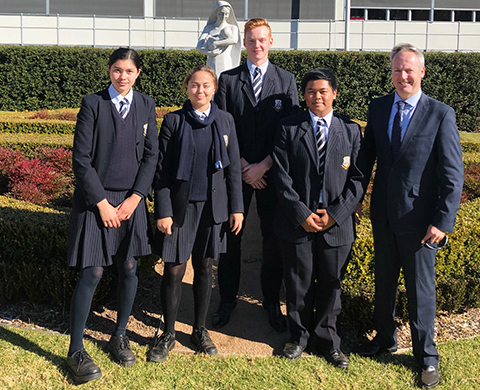 We often talk about and celebrate the wonderful community that we belong to; I had further reason to reflect on our wider community while attending Mater Dei’s St Benedict Feast Day celebrations with four Year 10 students. Mater Dei is a fellow Good Samaritan school located in the Camden area that was established as a special school in 1957, Mater Dei is an organization that provides early intervention therapy services and education for babies, children and young people with an intellectual disability or developmental delay. The underpinning philosophy for all that Mater Dei does, is inclusion into the wider community. Inclusion is based on the dignity and uniqueness of each person, self-esteem, respect, equity, independence, interdependence and responsibility. Their motto is ‘Inclusion for All’. It is great to be a part of the Good Samaritan community and the day allowed our students to interact with the Mater Dei students as equals. All our students commented on what a privilege it had been to be part of their special day. It was hard not to feel immense pride and emotion during the beautiful mass and to witness the Mater Dei students ensure that we were welcomed and part of their day. It truly was a beautiful gift! Days like these remind us of our community and the hospitality that Benedictine communities extend to welcome the stranger. I hope that we all can welcome the stranger so that the stranger becomes more than a guest but rather part of the community!